I've been pouring over all of the games and applications pouring into the iPhone App Store since it launched. It's actually a sort of OCD nightly ritual. I'm not sure why I'm so obsessed with them and I rarely buy any. Since day one, one of the apps I've been on the look out for was the inevitable Xbox Live app. It only makes since that someone would throw together a little program that allows gamers to check out their Xbox Live friend's list when they're on the go. Today such an app popped up. 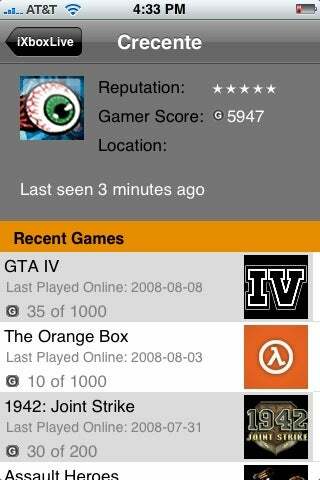 The good news is that for 99 cents iXboxLive allows you to check out your buddy list, see what they are doing, their gamer pic, score, reputation and location. You can even see a list of their recent games, including a breakdown of gamerscores and when they last played the title. The bad news, well the bad news is pretty significant.The developer says that because of limitations created by using the Microsoft Xbox Community Developer SDK, the program doesn't actually retrieve your Live buddy list. Instead you have to manually enter the names. OK, not that big deal. Also the developer "highly discourages" adding more than a dozen or so gamertags to your local buddy list. The loading time will increase significantly for each gamertag you add, according to the app. I checked it out with four names and the loading time was quite short. I did run into a couple of issues, including telling me one friend was online when he had been offline for three hours. Also it changed another friend's name to a series of question marks. Another downside is that you can't message with your Live friends and you can't actually go into the games they played to see which achievements they've unlocked. While some of this stuff is bound to be added with future builds, the dev says that messaging is right out. Come on Microsoft, it's time you step up to the plate and deliver that Live Anywhere experience you talked about years ago.